Lucy and Viv attend Lucy's college reunion at Milroy so they can show Chris the campus. Lucy helps Chris revive the old tradition of stealing the statue of the school founder, which was usually ignored. This year, however, the Dean is cracking down, and Lucy and Viv scheme to make things right. Lucy and Viv end up having to return the heavy sculpture of Zachary Milroy before someone has to face the consequences. In the process, Lucy inadvertently locks themselves up in the top of the bell tower. Special Notes: We learn in this episode that Lucy Carmichael's maiden name was Taylor, although these facts will change in later years. The next time the topic comes up, in Season 5, "Lucy and John Wayne", she says her maiden name is MacGillicuddy. This is the same maiden name Lucy Ricardo had on I Love Lucy. 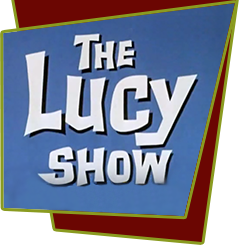 Lucy's status as a college graduate will be forgotten in Season 6, "Lucy Gets Her Diploma", where she claims to be a high school dropout. Bloopers: In a closeup of Vivian wrestling with the statue in the tower, you can clearly see where two sides of the "sky" meet, forming a corner.